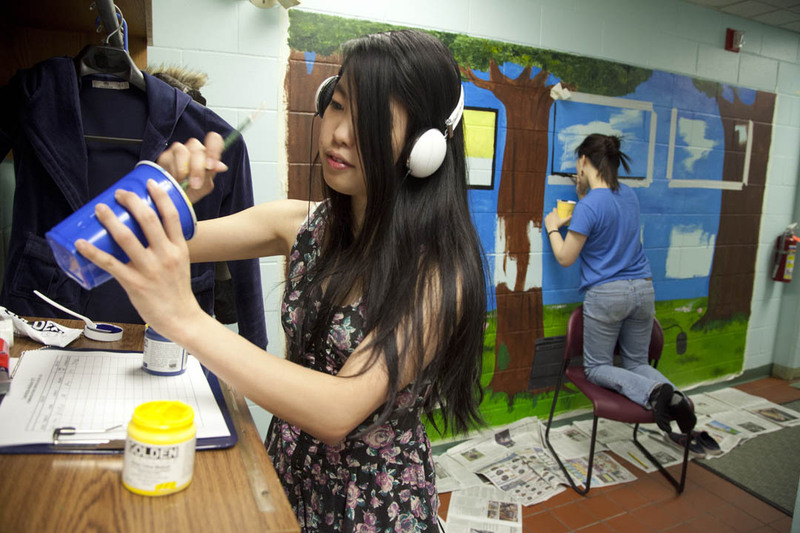 Tobi Liaw '12 mixes paint while Jee Hye Kim '12 applies it as they work on their mural at the Lewiston-Auburn 911 Communication Center. Photograph by Phyllis Graber Jensen/Bates College. On a normal disaster-free day, most of us probably give little thought to the people who pick up the phone when we dial 911. But the emergency dispatchers who serve Lewiston, Poland and Auburn have recently been much on the minds of two student artists from Bates. Jee Hye Kim of Fort Lee, N.J., and Kimberly “Tobi” Liaw of Ontario, Calif., have dedicated their talent and free time this spring to making things better for the staff of the Lewiston-Auburn 911 Communication Center. These everyday heroes spend most of their waking hours in a dark room looking at computer screens and waiting for the next distress call. The center itself is behind locked doors in the basement of a fire station in Auburn. Robinson Copland, office manager and himself a dispatcher, wanted to spruce up the dispatchers’ working environment. So he reached out to Bates. Kim and Liaw, both seniors, responded to the request that came via a friend. Robinson worked with them to design a mural that serves two purposes: to bring a glimpse of nature indoors, and to honor the work of both the dispatchers and the firefighters, EMTs, police and others who cope with emergencies. The mural shows a variety of first responders in action, framed by screens juxtaposed against a woodsy backdrop. Liaw and Kim painted the mural, measuring 10.5 by 6.5 feet, in acrylic in a busy main corridor at the communications center. For eight hours a day, 16 if they pull a double shift, the L-A dispatchers each face a battery of flat screens displaying myriad information — incoming phone numbers, emergency-service radio frequencies, maps, views from surveillance cameras, etc. The room is kept dark to make the screens easier to read. 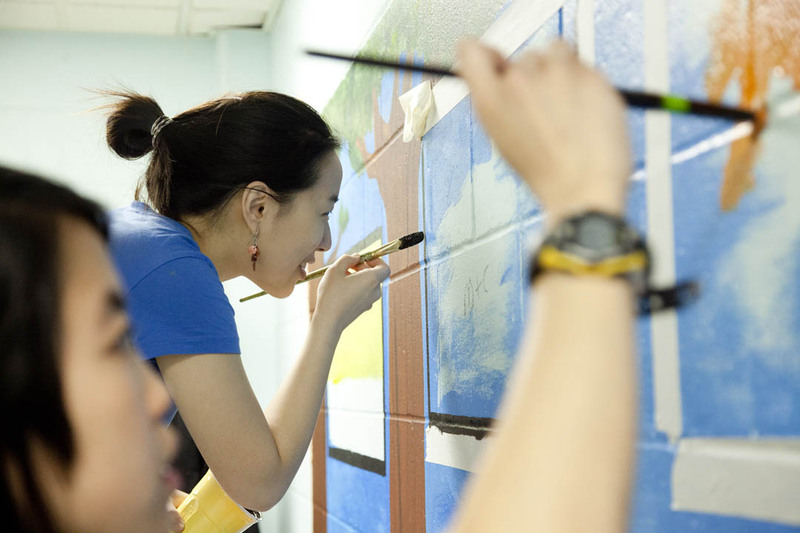 Tobi Liaw '12, foreground, and Jee Hye Kim '12 work on the mural at the Lewiston-Auburn 911 Communication Center. Photograph by Phyllis Graber Jensen/Bates College. Four to six dispatchers are on duty around the clock. They not only send first responders to emergency situations, but themselves offer as much aid as possible over the phone. They rely on a complex set of protocols, arranged like flow charts, that can guide callers in all kinds of dire situations, from an accidental poisoning to a stuck accelerator in a car. The Bates artists volunteered their time, about 30 hours in all, and a grant from the Harward Center for Community Partnerships paid for materials. “This is a good thing to do for the community that I’ve been a part of for the last four years,” says Liaw. “And I really wanted to do something to give back. Friends and roommates, the pair complemented each other well in executing the mural. Liaw did more of the natural imagery, while Kim focused on the technical depictions.